Over the past year or so, I've gotten friendly with the folks at Diageo, which means that they occasionally send me some of their products to have fun with. That company might not sound familiar to you, but you're probably familiar with many of their brands like Captain Morgan, Smirnoff, and Guinness, among others. 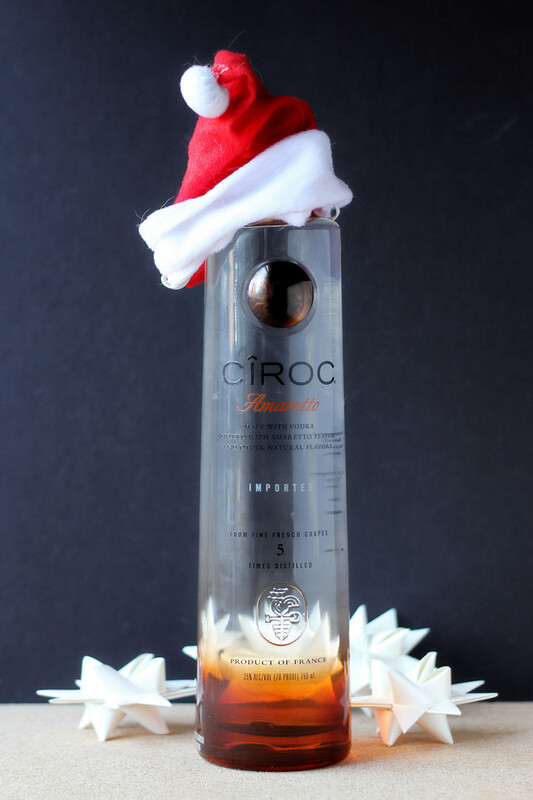 This time around, I received a bottle of Amaretto-flavored Ciroc from them. If you're not familiar with Ciroc (and I wasn't particularly familiar), it's a vodka distilled from French grapes. Fancy. They have an unflavored version, as well as several flavored ones, but so far I've only tried the Amaretto-flavored. I have to say I was pretty impressed with it, and as soon as I tasted it, I knew I was going to have fun making some cocktails. 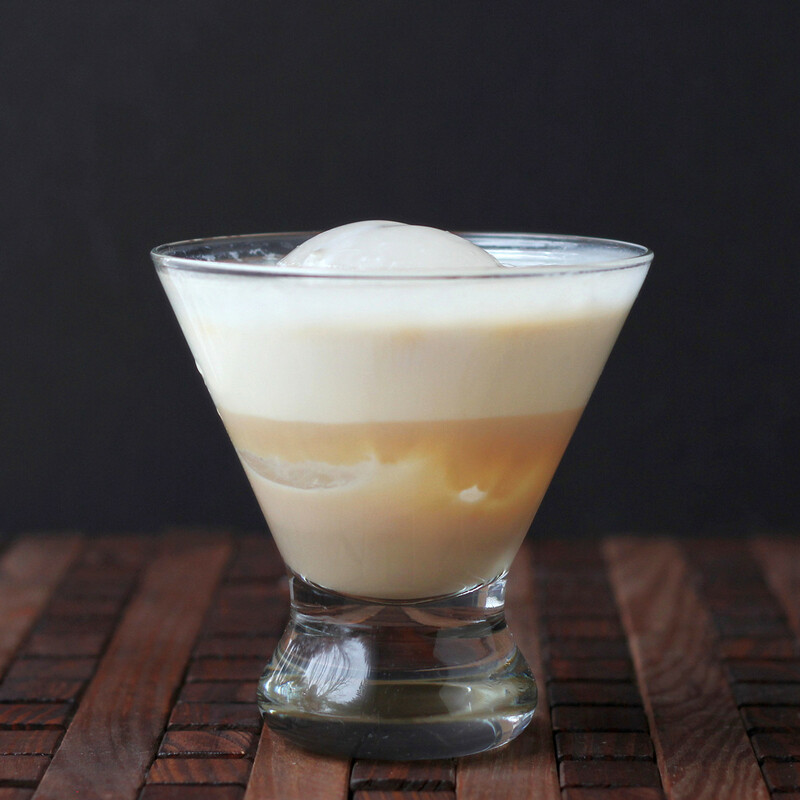 This creamy cocktail is rich and elegant. Perfect for toasting the New Year at home in front of a fireplace. Or at a party. But I'm more likely to be home and safe and cozy. Before I created a recipe for the New Year, I looked up things that are considered lucky, thinking I might incorporate one of them. Some weren't worthy for ANY cocktail. Let's not even go there. Round fruits were a possibility for some sort of cocktail, but probably not this one. So I opted for a giant round ice cube instead. Because it's not the fruitiness that's lucky. It's the roundness. Put a large round ice cube in an appropriate glass. No round cubes? Use cubeular cubes. Or any shape, really. If you want a layered drink, pour slowly and carefully to create those layers. The Baileys will sit happily on the bottom of the glass, the half-and-half will float on that, and the Ciroc will float on the very top. If desired, you could substitute milk, heavy cream, non-dairy creamer, soy milk, nut milk (or anything else you like) for the half-and-half. If you don't want to bother with layering, just add all of the ingredients to the glass and stir to combine. The layering is just for presentation. But it's kind of neat. Another option is to mix the half-and-half with the Ciroc, then layer that on the Baileys, giving you two creamy layers. Have you tried Ciroc yet? Plain or flavored? These biscuits have a nice, sweet honey flavor from the yogurt, without being too sweet, so they're perfect for breakfast or for dinner. If honey isn't your thing, there are are plenty of other yogurt flavors available today that would work really well, so have fun and use something you like. And biscuit-making doesn't get much easier than this. I'm serious. You don't need any super-fancy mixing equipment. A bowl and any old spoon or spatula will do. You don't need to cut in any butter. You don't even need a rolling pin. Okay, it helps if you have a biscuit cutter . And you do need an oven. But still, this recipe has only three ingredients, and the technique isn't very complicated. In about 20 minutes, you'll have fresh, hot biscuits, ready for a little butter. Different brands of Greek-style yogurts can vary a little in thickness, so you might need more or less flour during the folding process, but this recipe is very forgiving. Preheat the oven to 450 degrees and line a baking sheet with parchment paper. Put the flour in a bowl and add the yogurt in the center, and then pour the milk in. 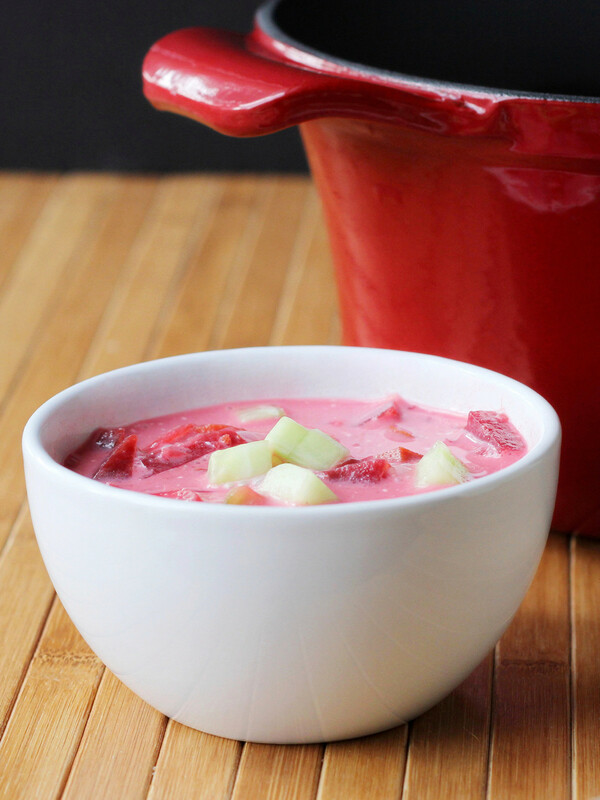 Using a spatula or wooden spoon, begin stirring at the center, working the yogurt in first, and continuing to stir until everything is combined. The dough should be well-mixed, so there's no more dry flour visible, but you shouldn't mix it like crazy. It should be a rough, shaggy wet dough. Flour your work surface and turn out the dough, Sprinkle a little bit of flour on top of the dough, then use your hands to pat the dough to about 1 inch think. Use a large spatula or a dough scraper to fold the dough in half. It will be loose and sloppy and not very cohesive, but that's fine. Pat the dough and fold it in half the same way three more times. With each fold, it will become more cohesive. After the last fold, pat the dough to an evenly-thick rectangle that's slightly larger than 6x9 inches. You don't need to measure it exactly - use a 3-inch biscuit cutter to measure it - you should be able to cut two biscuits in one direction and three in the other direction, with a little bit of dough scrap around the edges. Cut those six biscuits and arrange them on the baking sheet, just barely touching each other. Gather the dough scraps and form them into a 3x6-inch rectangle and cut two more biscuits and place them on the baking sheet. Gather the remaining dough scraps - there shouldn't be much left. Form it into a small round biscuit and place it on the baking sheet. This is the perfect sample for the baker. If you like, brush the tops of the biscuits with milk, cream, or soft butter. Bake at 450 degrees until the biscuits are golden brown on top, about 15 minutes. Remove the biscuits from the pan and let them cool slightly on a rack. Serve warm. Meanwhile, I leave you with this. 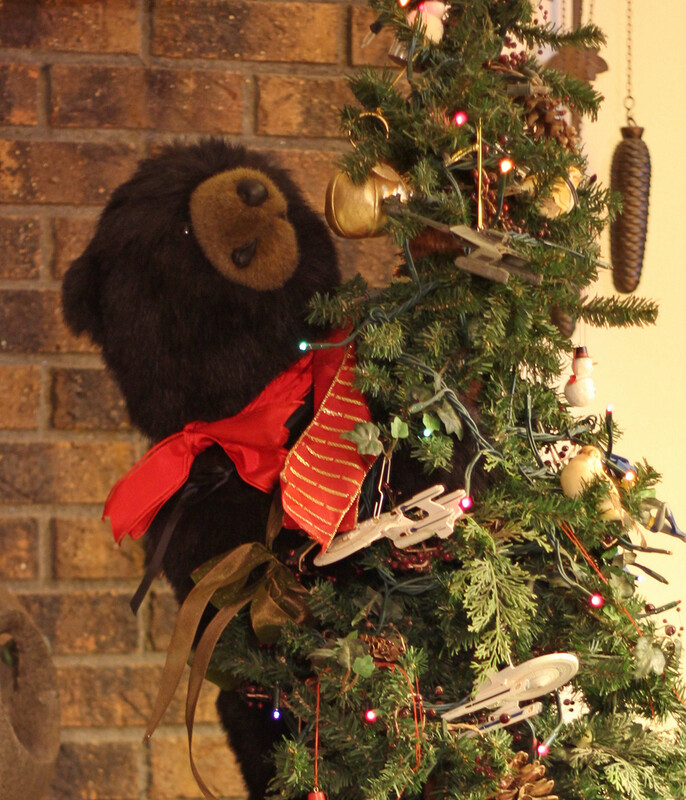 I hope you holidays are fantastic! 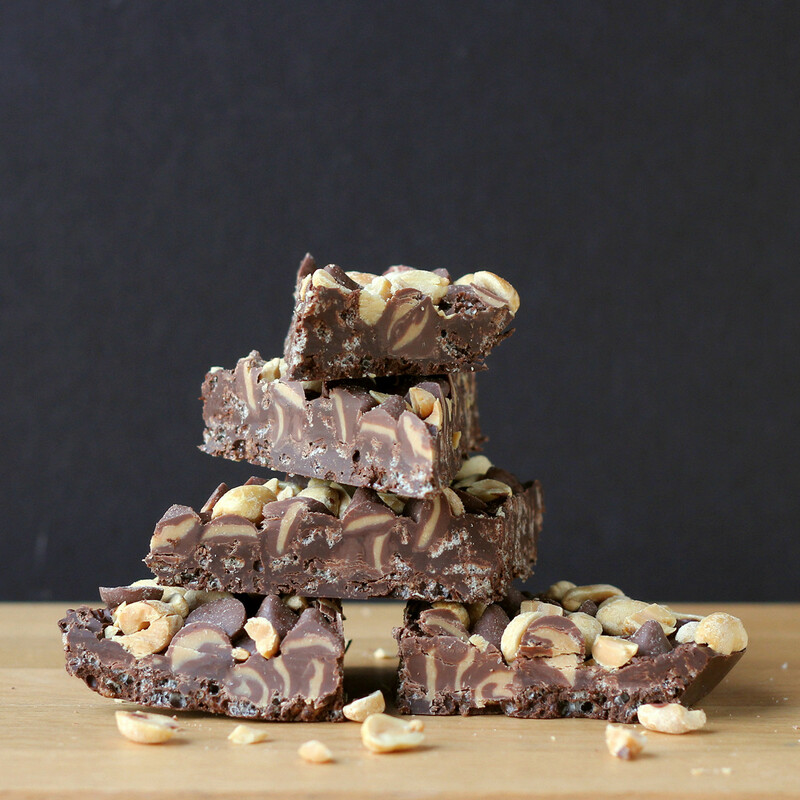 People get soooo excited about chocolate bark, don't they? One of the best things about it is how FAST you can make it. 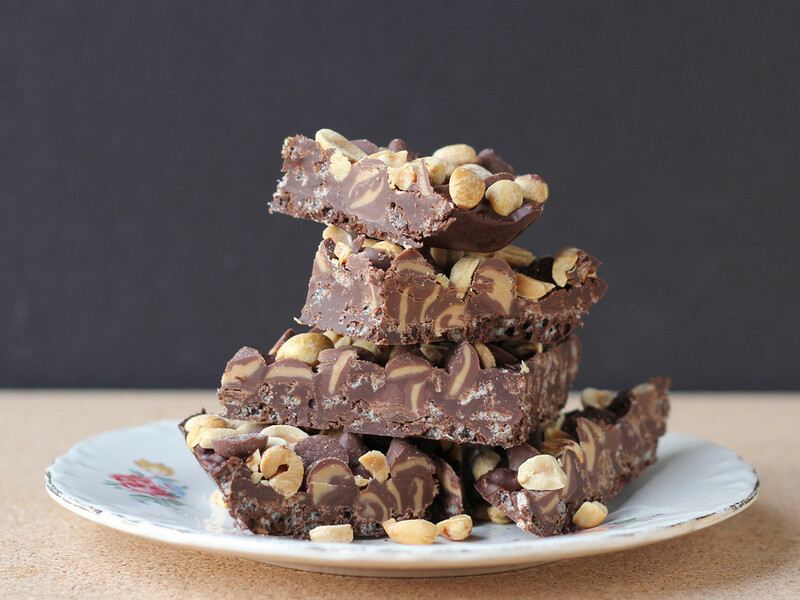 I decided to make my own version, but instead of a smooth chocolate with stuff swirled or sprinkled on top, I decided that I wanted something like Nestle Crunch bars - you know those, right? With the crisp rice cereal? Yup, those. And then I also put stuff on top. I just can't help myself. I bought Cocoa Krispies instead of plain Rice Krispies, because I had other plans for the cereal where the chocolate made more sense. Feel free to use plain old Rice Krispies, or any other similar brand. I assume there's some sort of other brand out there. Have a suitable silicone mold standing by - about 8-inch-square is good. I didn't have an actual bark mold the size I needed, so I used another square silicone container I had that was close to the right size. 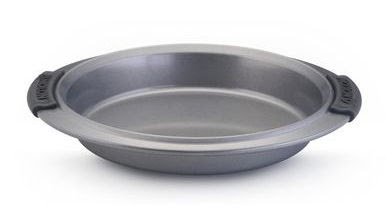 A silicone cake pan would work well. Put the chocolate in a microwave-safe container. I used a large glass measuring cup. Melt in 30-second increments, stirring after each blast, until the chocolate is melted and smooth. Fold in the Cocoa Krispies. Transfer this to your mold, and level the top surface. It will be bumpy, but that's fine. Sprinkle the DelightFulls chips over the top, then sprinkle the peanuts on, filling in the gaps between the chips. Press the toppings down lightly - you don't need to submerge them - just press them gently so they adhere to the melted chocolate. 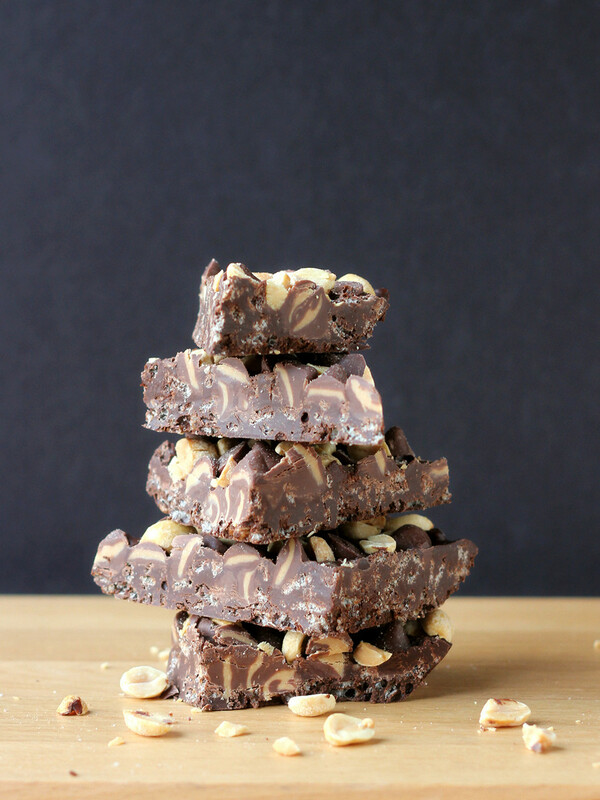 Refrigerate until the chocolate firms up, then cut or break the bark into pieces. I took a poll to see if people cut or broke bark, and most said they broke it. I opted for slicing, because I wanted to show the pattern that the insides of the DelightFulls made in that upper layer. Note: I previously did a sponsored post for Nestle DelightFulls, but this particular post is not sponsored by Nestle or any of the other brands listed. I bought all this stuff. 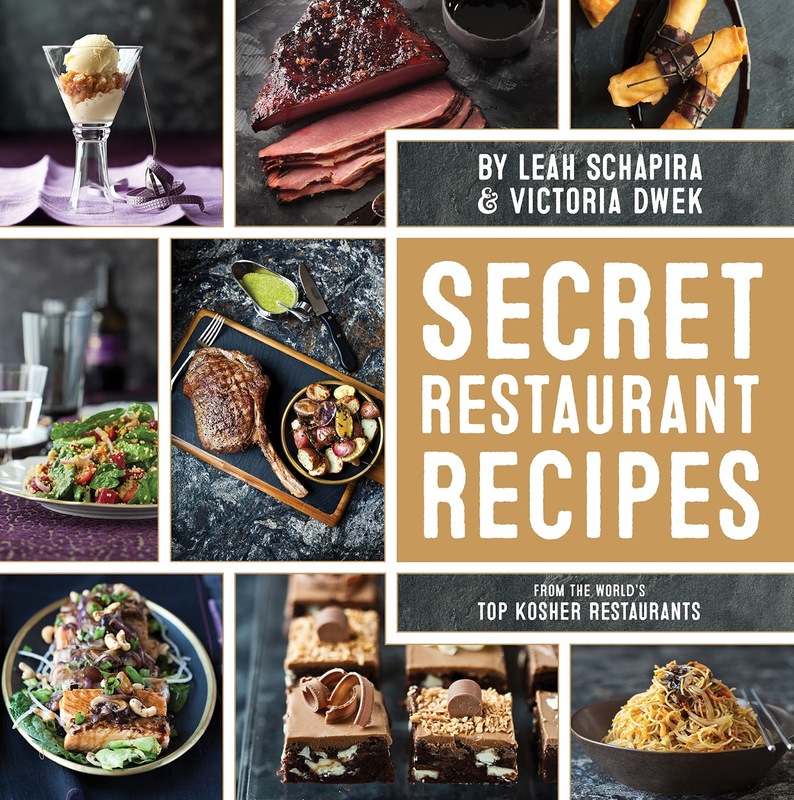 So, the other day the book Secret Restaurant Recipes (from the World's Top Kosher Restaurants) arrived at my door. Hmmm. Did I request this? Win this? I'm trying to get all my holiday ducks in a row so I can actually take a few days off, so I've been a little scattered. And some days I just don't remember what I emailed to whom. In any case, I didn't pay for this book, and I'm fairly certain it came from the publisher and not some secret admirer. These restaurant-compilation books are always fun because the recipes are usually so varied. Not only different restaurants and chefs, but they're choosing a small sample of their recipes. There was everything from salad to dessert, and a lot in between. Simple and complicated. Common ingredients and not so common. One recipe that caught my fancy was a recipe for sweet pickles from a restaurant called Milt's Barbecue for the Perplexed in Chicago. For one thing, I used to live in Chicago. And for another, I love pickles of all kinds. These pickles looked a lot like the bread and butter pickles that my mom made when I was a kid, with a few interesting differences. For one thing, I had to blend an onion, which then became part of the pickling liquid. But just like the pickles my mom made, and some of the ones I've made since then, these included turmeric, which turned the liquid a brilliant yellow and colored the pickles and onions as well. The recipe was supposed to make 1 quart of pickles, but I decided to cut in in half. Refrigerator space is at a premium right now, and I simply figured that a pint would be a good enough test. So, I cut everything neatly in half ... and ended up with a quart-and-a-half of pickles. Hmmm. That's odd. My first thought was that we understood English cucumbers to be different things, and I had way more cucumber than I should have. But that doesn't seem likely, since the ratio of pickle to onion seemed right in my jars. If I had used that much less cucumber, I would have ended up with pickled onions with some cucumbers thrown in. And that wouldn't be right. I suspect that what happened was that someone took a restaurant-sized recipe and cut it way back to an amount that could be made in a home kitchen. And then they looked at the giant bucket of restaurant quantity pickles and figured that if if was divided, it would be about a quart. When I made this, I left out one thing - it called for 1 teaspoon of pickling spice, which would have been 1/2 teaspoon when I divided it. My pickling spice includes large shards of bay leaves that wouldn't have fit in a half-teaspoon, along with mustard seeds that are already in the recipe, and some scattered allspice berries. I figured that if I tried to get a half-teaspoon of pickling spice, I'd end up with mustard seeds and not much else. These pickles were really good, similar to the ones mom made, but with a little more onion flavor. And although these are called sweet pickles, they have a good bit of tartness, too. Which is perfect for me. I'm looking forward to seeing how these change over the next few weeks. The square-ish container is by OXO . Add the sugar, mustard seeds, celery seeds, turmeric, red pepper flakes, pickling salt, and pickling spice. Bring to a simmer. Put the cucumbers in a stainless steel bowl. Slice the second onion as desired and add it to the cucumbers. 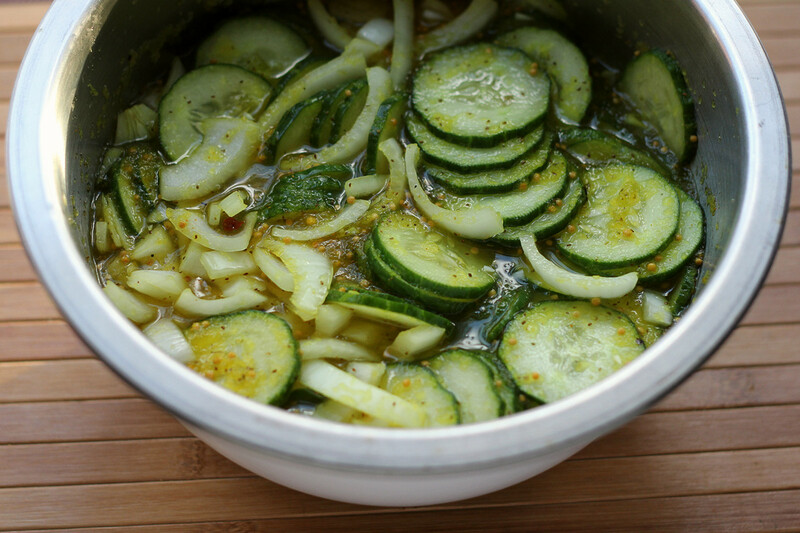 When the vinegar mixture comes to a boil, pour it over the cucumbers and onions and give it a stir. 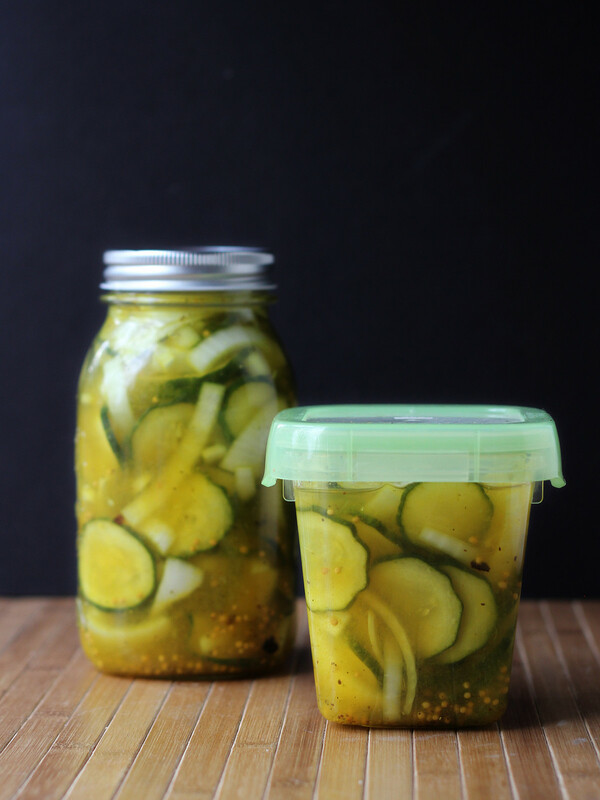 Place a plate or another bowl on top of the cucumbers to weight them down a little to keep them below the liquid and set aside until it has cooled to room temperature, then transfer to jars or other storage containers. Cover and refrigerate. These are ready to sample as soon as they cool, but they're better after 24 hours (particularly the onions) and they'll continue to pickle over the next week or two. Disclaimer: I received this book from the publisher. I have absolutely no problem wandering into the kitchen and whipping up random recipes based on what's in the refrigerator or the pantry. I've got no trouble wandering a grocery store, looking for sales, and creating the bones of a recipe while I'm filling my cart. But lately I've fallen in love with my cookbooks all over again. 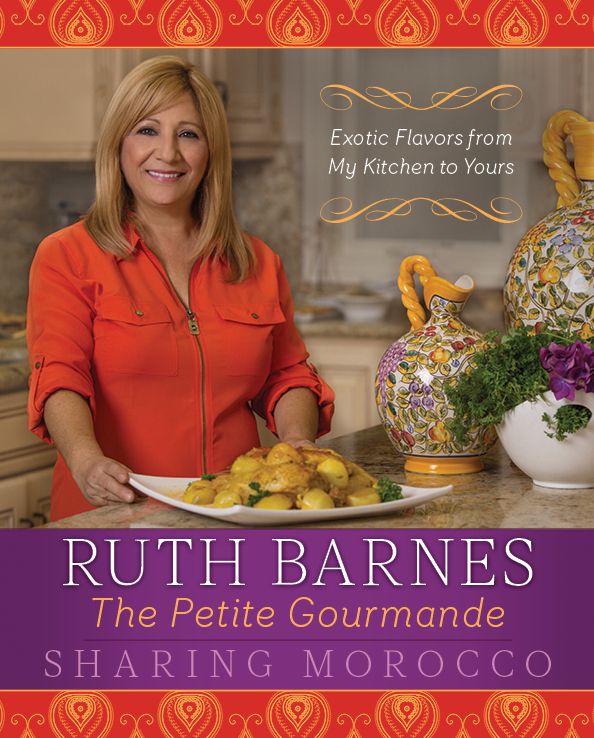 I've been participating in book tours, like this one for the book Sharing Morocco. In case you're not familiar with book tours online, it's when a bunch of bloggers all get a cookbook and post about their experience with the book, sometimes with a recipe. And, this time, I also have one to give away! 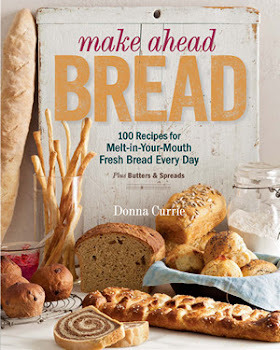 Some bloggers like to do interviews or commentary about the style of the book, but I always opt for a recipe, because I think that's what makes readers want a book. When I saw that one of the recipes permitted for posting was a pepper salad, I knew that's what I had to make. When I was a kid, I loved green olives (which I understand most kids don't) because of the pimento stuffed in the center. Back then, I thought pimento was something very exotic. I really didn't know if it was fruit, vegetable, or something else. But I totally loved it. I also loved bell peppers when I was a kid, but we mostly ate them green. 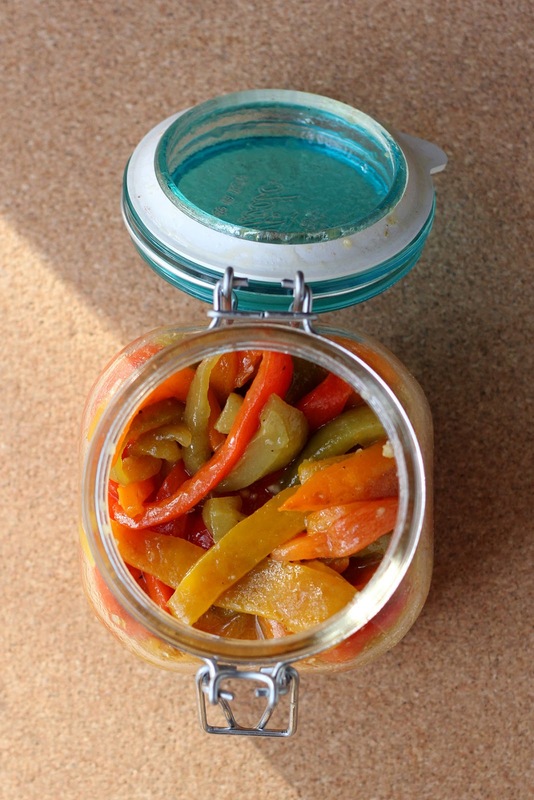 If I'd only known that pimentos were ripe and roasted bell peppers, it would have rocked my world. I was particularly pleased that this recipe was called a salad rather than a garnish or condiment. Bell peppers are awfully popular, but seldom the star. I figured it was about time they got their proper place as a vegetable and not just a flavoring agent. I used elephant garlic for this, since it's milder and I wanted to tame the garlic flavor just a little bit. I like garlic - a lot - but this time I wanted it just a little milder. While this is great as a side dish or salad, it would also make a good topping for a sandwich or added to pasta or tossed into a green salad. Or, if you're me, just attack it with a fork. The instructions suggested having it in a serving bowl, but I thought it looked pretty in a jar. And it was easier for storage, too. The author said: This colorful salad is an excellent side to any main dish or fantastic on its own or with any bread. It is usually found at meals for family gatherings (my daughter always requests it for such occasions) and will brighten up any lunch or dinner table. Preheat the grill on medium heat. Grill the peppers, turning with tongs, until the skin is loose and charred on all sides and the peppers are tender. Allow the peppers to cool and then remove the skins. Cut away and discard the stems and seeds from the peppers. Cut the peppers into strips, put in a serving bowl, and add the garlic, olive oil, and lemon juice. Season with the salt and pepper, and mix to combine. Note: I thought these were better after even longer storage - like the next day. The flavors had more of a chance to mingle, and the bite of the garlic was softened a bit more. I received this book from the publisher, and they are providing one copy for a giveaway. 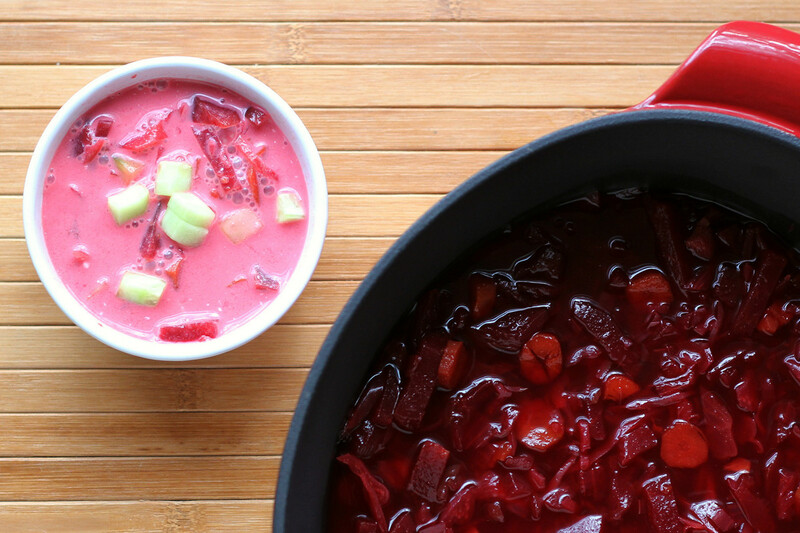 When I was growing up, beet soup, otherwise known as borscht, was often on the table, but it was pretty much guaranteed to be served on Christmas Eve. 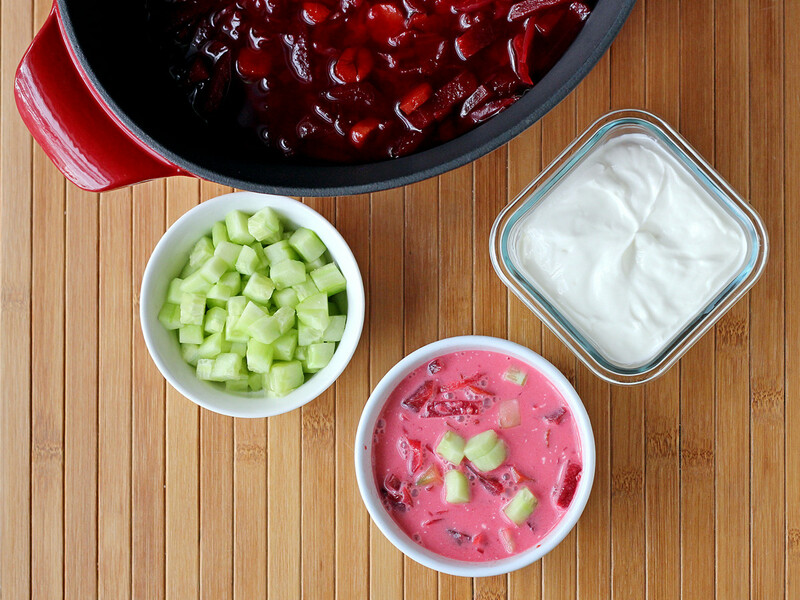 Mom's beet soup didn't vary very much, and it always included sour cream to be mixed into the finished soup, and diced cucumbers to add some crunch. 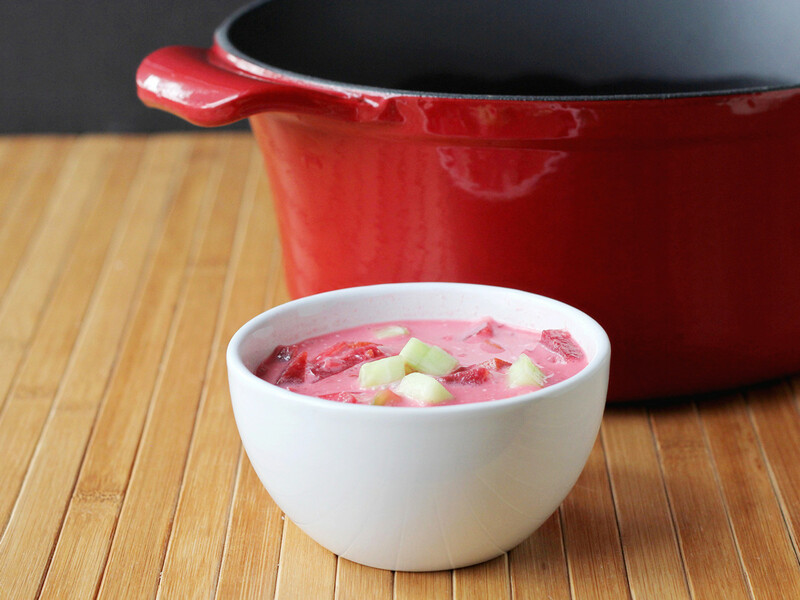 Later I found out that there were a huge number of variations of borscht, including one with tomatoes and another with no beets at all. This version is similar to what mom made, as far as ingredients, but it has one major change - I roasted the vegetables instead of boiling them, which gives the soup more depth of flavor. But the sour cream, which adds body and richness to the soup - and turns it a beautiful bright color - and the crunchy cucumbers are still in the soup. Want to give it a try? You'll find the entire recipe over on Anolon's website. It's waiting for you RIGHT HERE. Oh, but that's not all! I have a MEGA-GIVEAWAY for you. Over the course of six weeks, I developed six different recipes specifically for the Anolon products. This is the last one. I'm a little sad that it's over, because it's been so much fun. But it's not quite over for you. There's that giveaway you can still enter. And I have ALL SIX Anolon items to give away. The same ones I got. And I'm giving all six to ONE PERSON. Isn't that AWESOME??? 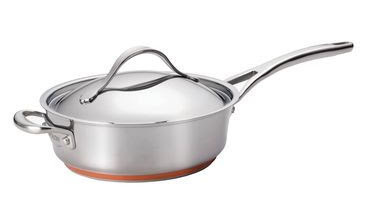 I'm pretty excited about this, because I LOVE Anolon products - I've already got some of their cookware, and I use it all the time, and I'm super-excited about the new stoneware and cast iron items. And Anolon is having their own giveaways, so be sure to stalk them during this 6-week promotion! I used this for the pie recipe, here. I used this for my bread pudding stuffing, here. I used this for my stuffed mushroom recipe, here. 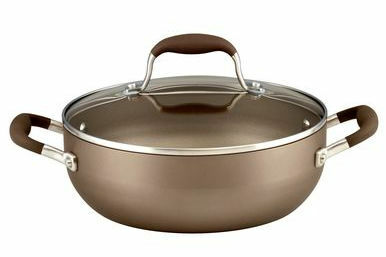 I made a risotto using this pan. The recipe is HERE. I used this pan for some pretty stunning stuffed artichokes. Recipe HERE. 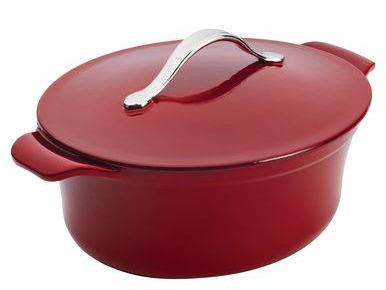 And this is the gorgeous red oval cast iron Dutch oven I used for my beet soup. Don't you LOVE it? I sure do! You need one more view of the soup. With the pan. And I'm giving all these great items away. Well, not the bowls or the soup, but all of the Anolon goodies will go to ONE LUCKY WINNER! All six! The giveaway starts when this post goes live and will end on December 26 at midnight, mountain time. US winners only. The giveaway widget will post with each week's recipe, and I will add NEW ways to enter each week related to the week's new post, like new tweets and new pins. So make sure you come back every week and see what I've made, and ENTER TO WIN! Want more Anolon in your life? This post is sponsored by Anolon. They supplied products for my use as well as compensation for recipe creation. They are also providing the prizes for the contest winner. Although I was paid to create a recipe, all words and ideas are my own. Welcome to Day Four of Christmas Week. This event is hosted by Kim of Cravings of a Lunatic and Susan of The Girl in the Little Red Kitchen. We hope to inspire you to break out those holiday sprinkles and get your bake on! Oh my gosh, oh my gosh, oh my gosh. If you like vanilla, THESE are the cookies you absolutely MUST make. 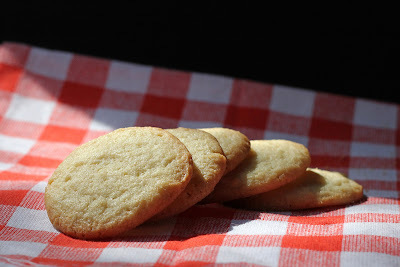 These cookies really show off the vanilla, along with a rich buttery flavor and just enough sweetness. When they’re first baked, they’re crisp on the outside and a little chewy in the center. After a day or two, they become crisp throughout. I knew I was headed in the right direction when I made these, but I didn't realize how good they were until I bit into the first one. And the second one. And then pretty soon they were all gone. Heat the oven to 375 degrees and line two baking sheets with parchment paper. In a medium bowl combine the flour, baking soda, and salt. Whisk to combine. In another medium mixing bowl using an electric mixer, or in the bowl of a stand mixer with the paddle attachment, cream the butter and sugar until it's light and fluffy. Add the egg and beat until combined. Add the vanilla and beat until combined. Add the flour mixture to the butter mixture and mix until well combined. Portion the dough into teaspoon-sized balls (a small disher works well for this) onto the prepared baking sheets, leaving room for them to spread. You don't need to flatten them - just scoop and go. You should be able to get 24 cookies onto each pan, but if you're worried about space, leave more room and bake more batches. Bake at 375 degrees until the cookies are lightly browned around the edges, 8 - 12 minutes. Transfer to racks to cool completely. Thanks to our sponsors for Christmas Week. 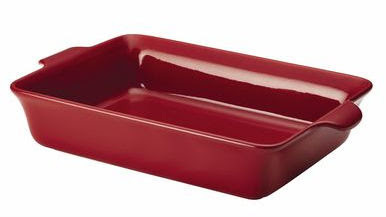 Anolon is donating a 5-piece Bakeware Set. Swing by their Facebook Page to show them some love. We also have Ball supplying us with 4 sets of Jars in their gorgeous Green Heritage Color. Swing by their Ball Canning and Recipes Facebook Page to say hello. More details on the prizes! One lucky winner (US only) gets ALL of this! I was not provided product or incentive for participating in this event.